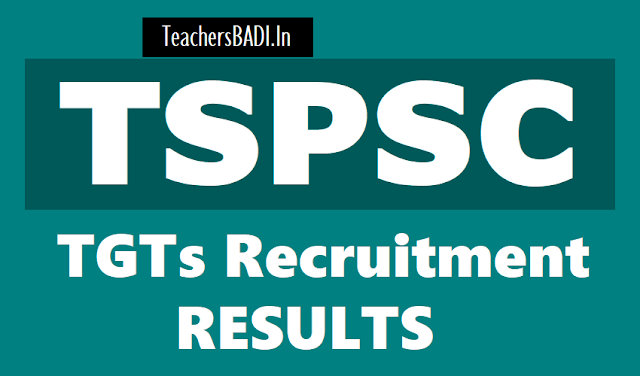 TSPSC TGT Physical Science, Biological Science, Sanskrit Final Selection List Results 2018, TSPSC TGT Maths Results 2018 - TSPSC Gurukulam TGT Biological Science, Sanskrit, Maths Final Selection List Results 2018 released: TSPSC TGT Biological Science, Sanskrit, Maths Selection list announced. On the basis of the Main Examination held on 20/07/2017 (Biological Science) & 03/09/2017 (Sanskrit) and subsequent Certificate Verification process held on 04/12/2017, 05/12/2017 and 29/11/2017 at Sankethika Vidya Bhavan, Masab Tank, Hyderabad and on 09/03/2018 and 13/03/2018 at TSPSC Office, Nampally, Hyderabad for Direct Recruitment (General) to the post of Trained Graduate Teachers (Biological Science and Sanskrit) in various Residential Educational Institutions Societies, 351 candidates in Biological Science and 04 candidates in Sanskrit with the following Hall Ticket Numbers have been provisionally selected in various Residential Educational Institutions Societies vide Notification No.14/2017, Dt:14/04/2017. However, the results of the PH candidates will be declared later. The selections are published here-with subject to the following conditions. It is hereby notified that, in compliance with the Hon’ble High Court orders in W.P. No.20232 & 20273 of 2018, dated 06/09/2018 a revised Selection, has been done for Direct Recruitment (General) to the post of Trained Graduate Teachers (Science) in various Residential Educational Institutions Societies superceding the selection Notification dt: 07/06/2018. 264 candidates with the Hall Ticket Numbers listed here under are provisionally selected for appointment to the post of TGT (Science) in various Residential Educational Institutions Societies on the basis of the Main Examination held on 30/08/2017 (Science) and subsequent Certificate Verification process held on 13/12/2017 at Sankethika Vidya Bhavan, Masab Tank, Hyderabad and on 09/03/2018 & 13/03/2018, 22/05/2018, 30/05/2018 and 03/01/2019 at TSPSC Office, Nampally, Hyderabad. The selections are published here-with subject to the following conditions. Besides that, the Commission reserves the right to take any action as it deems fit in the circumstances of the case, in terms of the provisions as notified in TSPSC Rules of Procedure published in Telangana State Gazette No.60., Dt: 28/12/2015. With this Notification of selection, the General Recruitment process notified vide Notification No.14/2017 for the post of Trained Graduate Teachers (Science) in various Residential Educational Institutions Societies has been finally concluded. The selections are subject to the final outcome of W.P.s and other cases pending, if any, before the Hon’ble High Courts of law. Two posts are kept vacant in compliance with Hon’ble High Court Order in 7289 of 2018. 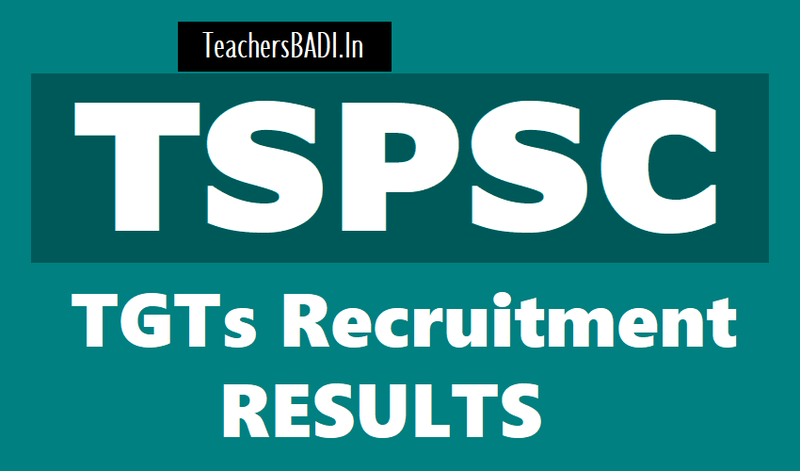 TSPSC TGT Biological Science Final Selection List Results 2018 (2nd time) announced: On the basis of the Main Examination held on 30/08/2017 (Science) and subsequent Certificate Verification process held on 13/12/2017 at Sankethika Vidya Bhavan, Masab Tank, Hyderabad and on 09/03/2018,13/03/2018, 22/05/2018 and 30/05/2018 at TSPSC Office, Nampally, Hyderabad for Direct Recruitment (General) to the post of Trained Graduate Teachers (Science) in various Residential Educational Institutions Societies, 264 candidates with the following Hall Ticket Numbers have been provisionally selected for appointment to the post of Trained Graduate Teachers (Science) in various Residential Educational Institutions Societies Notification No.14/2017, Dt: 14/04/2017. The selections are published here-with subject to the following conditions. With this Notification of selection, the General Recruitment process notified vide Notification No.14/2017 for the post of Trained Graduate Teachers (Science) in various Residential Educational Institutions Societies has been finally concluded . Selection Notification for the post TGT ( Science) Notfn. No.14/2017 and Notification No.14/2017 TSPSC Science Subject Marks List of Provisionally Selected Candidates: వివిధ సంక్షేమ గురుకులాల్లోని ట్రైన్డ్‌ గ్రాడ్యుయేట్‌ టీచర్‌(సైన్స్‌) పోస్టులకు నిర్వహించిన భర్తీ ప్రక్రియలో 264 మంది అభ్యర్థులను ఎంపిక చేసినట్లు టీఎ్‌సపీఎస్సీ సెక్రటరీ వాణీప్రసాద్‌ తెలిపారు. ప్రాథమిక జాబితాలో ఎంపికైన అభ్యర్థుల హాల్‌టికెట్‌ వివరాలను కమిషన్‌ వెబ్‌సైట్‌లో పొందుపరచినట్లు పేర్కొన్నారు. Gurukul TGT Physical Science Marks List of Provisionally Selected Candidates. Gurukul TGT Sanskrit Marks List of Provisionally Selected Candidates. Note: The candidates who are selected for the post of TGT (Physical Science) are requested to relinquish their claim for other subjects of TGT or TRT posts, so that the Commission can select any other candidate according to Rules as per 6-A of TSPSC Rules of Procedure. The relinquishment form is provided with this Selection Notification vide web link which will be available from 02/04/2018 on website www.tspsc.gov.in. Last date & time for submitting relinquishments is 04/04/2018 upto 12 noon only. On the basis of the Main Examination held on 20/07/2017 (Mathematics) and subsequent Certificate Verification process held on 05/12/2017, 06/12/2017 and 07/12/2017 at Sankethika Vidya Bhavan, Masab Tank, Hyderabad and on 06/03/2018 & 13/03/2018 at TSPSC Office, Nampally, Hyderabad for Direct Recruitment (General) to the post of Trained Graduate Teachers(Mathematics) in various Residential Educational Institutions Societies, 805 candidates with the following Hall Ticket Numbers have been provisionally selected for appointment to the post of Trained Graduate Teachers (Mathematics) in various Residential Educational Institutions Societies Notification No.14/2017, Dt: 14/04/2017. However, the results of the PH candidates will be declared later. The selections are published here-with subject to the following conditions.